Thanks to something called Petabyte computing (one quadrillion bytes of computer information), we’re encountering a number landslide. AT&T has about 16 petabytes of information switching through its network every day. Facebook has 1.5 petabytes worth of user photos alone. If you want to comprehend this data deluge, how do you sift through it all? While some say understanding is beside the point, designers are employing infographics as a handy tool to organize massive data heaps. Hence you have the NYT’s sophisticated graphs breaking down a story’s numbers, or Obama’s data.gov where you can spend hours poking around Federal datasets. You can even create your own with online graphic generators that do a lot of the work for you. And even if real designers mostly put their skills to use for marketing (it pays the bills), there are others out there using elegant infographics for social problem-solving. Hans Rosling’s GapMinder is getting deserved attention for its mission to promote “sustainable global development” using “statistics and other information about social, enonomic and environmental developments…” He won a TED award for his colorful, floating bubbles on white graphs that reveal sobering facts on HIV, CO2 emissions, and poverty. Now to Otto Neurath. Who is he? I went to Yuri Engelhardt‘s useful lecture at UvA on this entire subject last Wednesday without a clue. But does this style look familiar? Neurath and his Isotype lab created many of the symbols that now humbly mark our bathroom doors or roadsigns that keep us all in line. He was all about anti-highbrow functionality, with a serious disdain for art for aesthetic’s sake. Drawing from a boyhood attraction to hieroglyphics, he amassed his images into a set of basic symbols that could be organized into graphs, breaking down critical information for the ‘common man’. In this way Otto imagined the possibility of a harmonious world, realized through the fusion of design and verbal signs into a flat, pictographic language that anyone could comprehend. The Isotype symbols’ simple beauty obviously has enormous influence on design today, beyond the bathroom stalls. Nigel Holmes is carrying the torch. So are young designers like Ian Lynam – you can see the influence in his e-waste video. 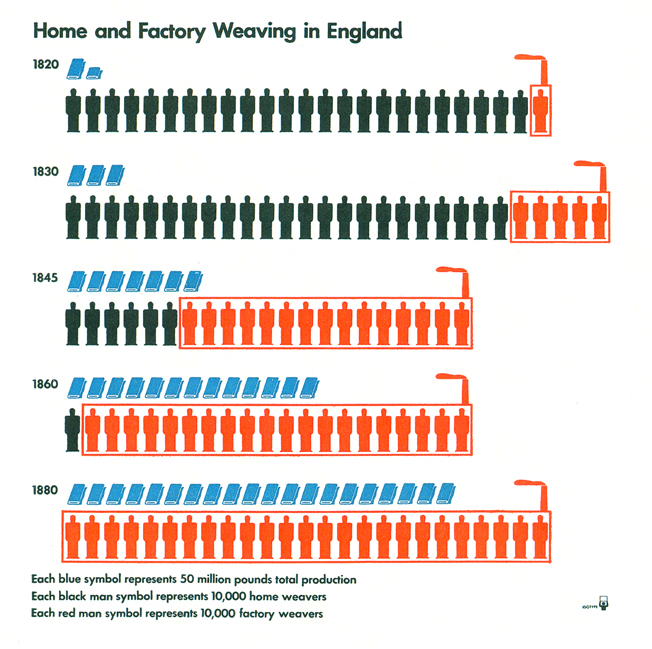 And you can also see Neurath’s optimism for the social role of infographics with Gapminder and other projects that help us make sense of the world – including its inequalities and deficiencies – through the sharp combination of raw data and good design. Thanks to Yuri Engelhardt for the examples of infographics from today and the past. this post reminds me of a report i read earlier in Taiwan about Paul Mijksenaar, who is dubbed as the master of info-vis design in the netherlands by Taiwan’s press.